On your marks, get set, EARN! 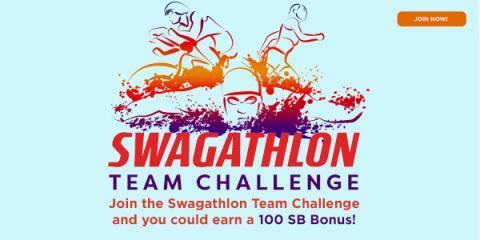 Swagbucks is holding a fun team challenge called the “Swagathlon” to help you earn free gift cards! For those of you who don’t know what Swagbucks is, it’s a website where you can earn cash back on everyday tasks you do online like shopping, answering surveys, discovering deals, and watching videos. You can even earn for searching the web! I’ve earned well over $500 so far in gift cards doing simple tasks like using their search engine, answering their daily polls and the occasional survey, shopping through their shop and earn links, and submitting codes. This has been a huge help for homeschooling books and supplies! If you’ve never tried Swagbucks before because you didn’t know where to begin, their Team Challenges are a great way to learn the ropes! The challenge, begins Monday, July 17th at 8am PT, but you can pre-register starting on Friday, July 14th! 1. Click here to join the challenge and be assigned to a team. 2. Starting June 17th at 8am PDT, in addition to earning SB you’ll contribute points to your teams total as you complete different activities on Swagbucks. 3. Check back on the page often to see the scores and what you’ve contribute so far. All members who participate and contribute at least 600 points to their team’s total will receive a SB bonus in the form of a SB Swag Up Rebate on their next gift card! Not only that, but if you sign up under me this month and earn 300 SB before August 1st, you’ll get a 300 SB bonus! Members of the 1st place team will receive a 100 SB Swag Up Rebate, members of the 2nd place team will receive a 50 SB Swag Up Rebate, and members of the 3rd place team will receive a 30 SB Swag Up Rebate. Your SB Swag Up Rebate will be made available on Friday, July 21st at 2pm PT and will expire on Friday, August 4th at 11:59pm PT. Let me know what team you get assigned to! I’m on the Pedal team! To help make your June a little sweeter, Swagbucks is holding a fun team challenge to help you earn free gift cards! For those of you who don’t know what Swagbucks is, it’s a website where you can earn cash back on everyday tasks you do online like shopping, answering surveys, discovering deals, and watching videos. You can even earn for searching the web! You can do as little or as much as you like to earn SB; there’s no minimum to keep your account active. I’ve redeemed my SB for hundreds of dollars worth of Amazon gift cards and paypal deposits; this has been a great blessing for our homeschool budget. If you’ve never tried Swagbucks before because you didn’t know where to begin, their Team Challenges are a great way to learn the ropes! Their latest, the “Sweet Treat” Team Challenge, begins Monday, 12 June. 1. Click here to join the challenge and be assigned to a team. Pre-registration is going on right now! If you don’t already have an account, you can sign up on this page as well. 2. Starting 12 June at 3pm GMT, in addition to earning SB you’ll contribute points to your teams total as you complete different activities on Swagbucks. All members who participate and contribute at least 400 points to their team’s total will receive a SB bonus in the form of a SB Swag Up Rebate on their next gift card! Not only that, but if you earn 300 SB before 1 July, you’ll get a 300 SB bonus (as long as you’ve signed up under me)! If you join up, let me know what team you get assigned to! I’m on Cake Bosses. Hope to hear from you! You have probably noticed that I’ve been posting here and there about upcoming Swagbucks events and special deals. But why? Is it not some sort of internet scam, a waste of time? Why do I keep posting about Swagbucks? Well, there are a few reasons! I can’t even remember exactly where or when I found out about Swagbucks…probably on someone else’s blog a few years ago. I was hesitant at first but decided to try it. I’m glad I did! Basically, you earn points called SB for doing a variety of tasks online. Some take only a few seconds, such as the daily poll. Many are tasks that you would do anyway, you just perform them through Swagbucks links, such as searching on browsers or playing games. You can take advantage of special deals, you can earn a percentage of what you spend making online purchases back in SB points, you can watch video clips, take surveys, and more. There are daily Swag codes that give you anywhere from 2 to sometimes 6 or 8 points simply for submitting the code. Every now and again there are Swag codes extravaganzas in which they release multiple codes in a day. After you’ve earned some SB points, you can redeem them for gift cards or a Paypal deposit. I usually redeem my points for Amazon gift cards which I then use for homeschooling books and supplies or household items. I really don’t spend that much time doing Swagbucks tasks..I usually just submit codes as they come out, search what I normally would using their widget, do the daily poll, and use their Shop and Earn program when possible for online purchases. I’ve also become a Swagbucks influencer, which helps me earn SB for spreading the word about upcoming events. Over time I’ve earned over a few hundred dollars worth of gift cards. This isn’t a scam, I can tell you that for sure! This has been a great help for our homeschool budget. So if you haven’t tried Swagbucks out yet, I encourage you to sign up and try it! It’s been a blessing for our family and for many others. Settling In, and Lots of Flowers! We’ve been in the new house for almost 3 weeks now and we’re settling in well! The kids are totally in love with the property and to be honest, so am I! We may not be able to walk to the library or just around town anymore but they have so much more space here than they’re used to that they haven’t seemed to miss it at all. There is a long driveway to ride bikes and collect stones on. Lots of birds to watch. And a couple of good climbing trees! The property is full of trees, most of which I have no idea what they are. Many of them are flowering right now and the yard is full of the hum of bees. We see lots of butterflies and I even saw a hummingbird yesterday, which I’d never seen at the old house despite putting feeders up. There are several lilac trees, which are my favourites. Unfortunately for my husband, his allergies don’t share my sentiments, but they’re only in bloom for a short time so hopefully his allergies will settle down a bit soon. I’ve been loving watching the birds and even saw a Baltimore oriole for the first time a few days ago! We had a ring-necked pheasant in the yard a few times and I can hear him call almost every day from somewhere at the edge of the property where there are lots of tall grasses and trees. The yard is also filled with dandelions. We don’t have a riding mower yet so they’ve been able to grow completely out of control and I’ve been looking for some recipes to use them in. I’ve made dandelion “honey” in the past but I’m looking for some new ideas to try this year. I’m thinking of making a dandelion infused oil and maybe some dandelion bread. I’ll let you know how it goes! Have you tried using dandelions in recipes? What have you made?